CrownSeal is a premixed, trowel grade elastomeric coating that forms a flexible waterproof membrane to protect chimney crowns and more. It dries in about 6 hours and cures in about 24 hours to a natural concrete/mortar appearance. Use on chimney corbels, the tops of masonry and parapet walls, or wherever a flexible waterproof membrane is needed. CrownSeal can also be used as a bonding mortar to replace badly spalled brick units, or for parging over brick faces that may have spalled, if remaining brick is solid. 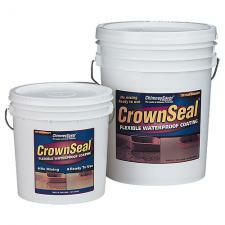 CrownSeal can be easily colored using standard mortar dye. It remains permanently flexible and carries a 10 year warranty. Available in 2 and 5 gallon pails. One gallon covers about 20 sq. ft at 1/8" thickness.